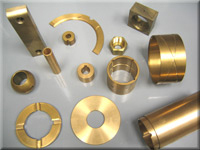 After nearly 10 years of continuous operation we have become one of the most reliable Brass Bushing and Brass Bearing manufacturers in the country. 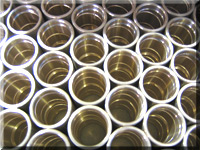 We can produce virtually any Bushing, Bearing or related part to your specification. If you don't have a drawing, we will work with you to reproduce your part from a sample. We are specialists in cutting lubrication grooves in virtually any pattern. Examples include our "Spira-Lube" Groove and "Rifle" Groove. Other common groove patterns available are figure eight, double figure eight, loop, double loop, circular, wick or straight. Any of these grooves can be contained within the length of the part or breaking out the ends. Call us for assistance in determining which pattern is most appropriate for your application.